During this study, a groundwater screening tool was developed to assess the temporal risk of groundwater contamination from the use of pesticides. It is based on a source, vector, target approach. The method utilised in this study uses a semi-quantitative probabilistic risk assessment where the input parameters were classified and assigned a relative score from 1 to 5 (i.e. 1 = no risk and 5 = high risk). The model was parameterised by using national data and calibrated with 2 years of national pesticide groundwater monitoring data. After calibration, two specific sites were selected for model validation. Based on the presence of the source, vector and target, the evaluation indicated that the temporal risk is site specific (i.e. May to December for the country model, June to September for the Oak Park site and September for the Castledockrell site). A sensitivity analysis performed on the national scale revealed that the groundwater vulnerability category (gv), the clay content (cc%), the persistence of pesticides in soil (DT50) and the rainfall represented by wet day (wd) were the most important parameters that affected model predictions (correlation coefficients of 0.54, −0.39, 0.35 and 0.31, respectively), highlighting the importance of soil hydrogeological conditions, soil type and rainfall in influencing water model predictions. 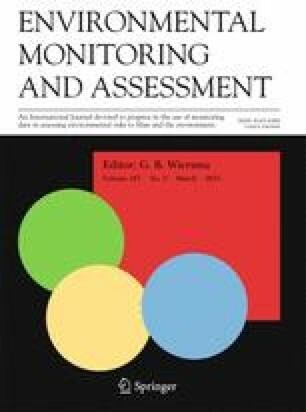 The model developed can help to identify the temporal risk from pesticides to groundwater and guide regulators in highlighting at-risk periods, therefore allowing more focused monitoring programmes. An erratum to this article can be found at http://dx.doi.org/10.1007/s10661-015-4758-1. The authors would like to thank the Irish Department of Agriculture, Food and the Marine (DAFM) under the Research Stimulus Fund. The authors are also grateful to Mannix A from the EPA and McManus SL from Trinity College who provided monitoring data at national and site scales, respectively. Chapman, D. (1996). Groundwater water quality assessments. In: WHO (Ed. ), A guide to use of biota, sediments and water in environmental monitoring 2nd Edn. ISBN 0 419 21590 5 (HB) 0 419 21600PB).http://www.who.int/water_sanitation_health/resourcesquality/wqachapter9.pdf. ChemSpider (2014). Data sources. Available at: http://www.chemspider.com/. Accessed 21 Nov 2014-11-22. DAFF (2004). Pesticide usage survey-arable crops. Online retrieved at: http://www.pcs.agriculture.gov.ie. Accessed 15 April 2013. DAFF (2010). Soil organic matter. Maintenance of soil organic matter. Available at: www.agriculture.gov.ie. Accessed 15 April 2013. DAFF Department of Agriculture Fisheries and Food (2003). Pesticide usage survey. Grassland and fodder crops. Online retrieved at: http://www.pcs.agriculture.gov.ie. Accessed 15 April 2013. ECPA (2008b). Counterfeit and illegal pesticides. http://www.illegalpesticides.eu/about/ Accessed 20 Dec 2015. ECPA European Crop Protection Association (2008a). Counterfeit pesticides across Europe. http://www.ecpa.eu. Accessed 20 Dec 2015. FOOTPRINT (2006). The FOOTPRINT pesticide properties database. Database Collated by the University of Hertfordshire as part of the EU-funded FOOTPRINT Project (FP6-SSP-022704). Online retrieved at: www.eu-footprint.org. Accessed on 15 Oct 2012. Kellogg, R. L., Nehring, R., Grube, A. (2000). Environmental indicators of pesticide leaching and runoff from farm fields. Available at: http://www.nrcs.usda.gov/wps/portal/nrcs/detail/national/technical/?cid=nrcs143_014053. Accessed 20 April 2013. Met Éireann (the Irish National Meteorological Service) (2013) Climate data and products. Online retrieved at: http://www.met.ie/climate/climate-data-information.asp. Accessed from 01 January 2011 to 24 February 2013. US Environmental Protection Agency (2014). ECOTOX database. Available at: http://cfpub.epa.gov/ecotox/. Accessed 21 Nov 2014.